Yesterday, I gave some basic photography tips to get you started. If you simply want to share photos with family and friends, then the basics are all you will need. However, if you want sell your work, such as on etsy, consider implicating these more advanced tips. So, with that thought in mind here is some more advanced lighting tips. How to Elimate Hard shadows and hard light: Use diffusers to create soft light. You can do this by placing a white shower curtain over a brightly lit window. Or you can purchase a photography studio box for about $40 to $50. These boxes have fabric on each side for you to diffuse light through. This lessens harsh and undesirable shadows. I have also created a square frame with inexpensive pvc pipe and covered it with a shower curtain or light fabric. Avoid using a flash as this creates harsh shadows. Play with the more advanced exposure settings on your camera. If you find yourself in a low lit area, instead of turning on lights, which can effect the white balance, try increasing the “exposure” setting on your camera by a notch or two. Take a test photo to see if the lighting is adequate. Use a mirror to bounce light underneath objects to highlight the bottom or take away harsh shadows. For a softer look, use white card stock to bounce light around and add a little highlight to certain areas. 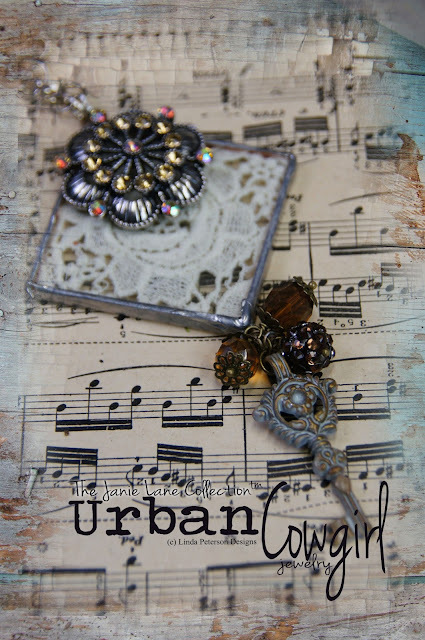 Style your photographs: Styling your jewelry or projects can really upscale their value. For ideas on how to style your jewelry, look at jewelry or fashion magazines for ideas. You don’t need to spend a fortune on props. Have a look around the house and get a little creative with your imagination. Perhaps you have a vase that you can dangle some earrings from? Or a nice simple wine glass? Sand? Rocks? Seashells, bottles, pretty paper and believe it or not, rice and black beans are great options too!. FOCUS FOCUS! Pay special attention to your focus settings. Small pictures can look in focus but when enlarged to full size can be way out of focus. Put your focus on the most interesting part of the subject. Take several photo’s from different angles – this will give you more photos to choose from and your potential customer a better idea of the pride you put in your work and know exactly what they are receiving. Adjust your lighting if necessary in a photo editing program such as photo shop. I always re-size my photos and check the lighting in my photographs. I try to bring the photograph in line with the actual colors I see. This is easy to do with the “auto color correction” option in photoshop elements. I also make sure that you can see all the detail and that lighten the photograph if I need to. Let’s put those tips into practice. Here Shari Wallace of WolfCreek Designs on etsy uses sand to stylize her photograph. 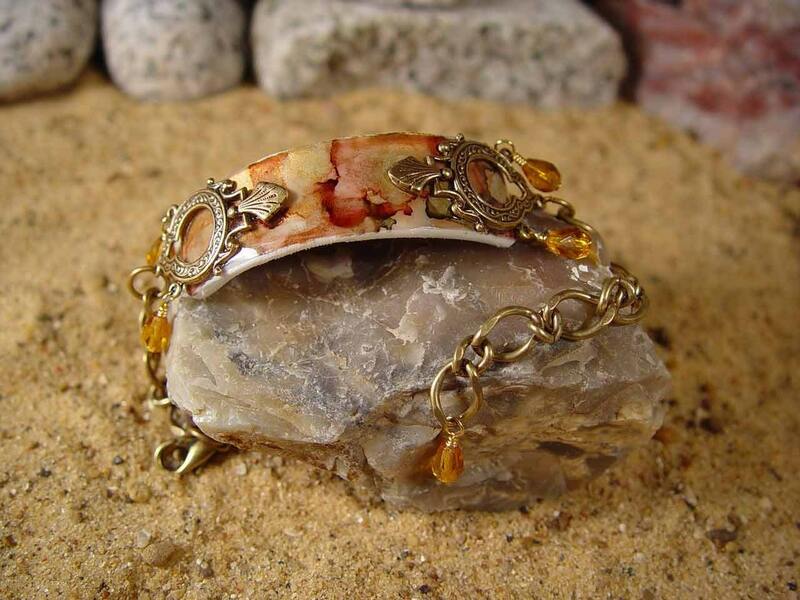 She’s displayed the bracelet on a rock, which adds a nice effect without being overpowering. Jana Ewy of Just Bananas always does a great job of stylizing her artwork in her photos. Here’s she’s used some inexpensive pebbles to add an organic touch. Notice that neither of these photos have harsh shadows and both are in clear focus. I believe if you put these few tips into practice, you’ll really make your artwork shine!!! Both of these artists feature Friendly Plastic in their artwork! Check out more of their work on the Friendly Plastic blog! In the recent day’s I’ve received a lot of email from beginners asking me about taking photographs. As we all know a photo is worth a thousand words. It’s your photographs that tell the story, about you, about your style and about your artwork. It’s important – very important – to take good photographs of your work – Why? Because it shows who you are as an artist. A good clear photo will show all the details in your artwork that you took so much time to create. A good styled photo says -I really care about the details, my work is outstanding! I take pride in my work! Select a digital camera that will do nice close up (macro) shots. This is very important. Use a simple background. A light grey, black or light blue works well. As an option you could use a pretty piece of 12 x 12 scrapbook paper with a gentle pattern. Stay away from pure white as this tends to confuse the camera and sends the white balance in a tizzy. Use natural lighting if at all possible. Shoot by a window, but not in direct sunlight. You can also take your project outside and choose a nice shady spot. This helps avoid shadows. Lighting is so important – so give attention to this particular tip! For nice detail, shoot the photo in as high of resolution that your camera will allow. Mine is 8mp. The higher the megapixel the more detail in your photo when enlarged. Here’s an important one…..if emailing your photo to your Flickr, Photobucket, Facebook or to me to share, please resize the photo down to an “email version”. Most photo editing programs will allow you to resize these photos to send quickly over the internet. If you are using Photoshop, simply click on FILE then SAVE FOR THE WEB and this will do the trick!! Here’s some samples that put these techniques into practice! I photographed this on a patterned piece of scrapbook paper. While the paper has a light pattern to it, it doesn’t detract from the Friendly Plastic pendant. You can see that the patterned background that I used above would not be a good choice for displaying a variety of beads, such as these beads created by Liz Welch. She effectively used a lighter grey background to highlight each and every bead. This is an example of a close up photo. Liz used a black background to make the individual bead stand out. The photo is clear. Just a word of caution, be careful using black backgrounds, since they could come off as greys, blues or purples. Have fun with the photography and stay tuned tomorrow as I give some more advanced tips!